Celebrity memoirs seem to be a dime a dozen these days (Parker Posey! Busy Philipps! ), so why read Ellie Kemper’s? Somewhat surprisingly, Kemper’s collection of tales from her childhood and career are as charming as she is onscreen, from The Office’s ditzy Erin to plucky Becca from Bridesmaids to the supremely resilient title character of Unbreakable Kimmy Schmidt. One can’t help but read this book in Kemper’s wholly Midwestern, frequently astonished, exclamation-point-loving voice, even as it become unclear where the optimistic actor begins and the equally positive Schmidt ends. It’s Kemper’s odd combination of moxie and self-deprecation (“My voice has not been described as ‘warm’ or ‘professional-sounding’ as often as it has been described as ‘please speak more quietly’”) that makes the string of stories that makes up this collection as irrepressible as the characters Kemper inhabits. She readily admits that her struggles were few, describing a summer spent taking improv classes in Chicago while working as an intern at Leo Burnett: “I told myself how brave I was to allow my parents to cover my housing, food, and improv comedy classes for the summer.” One of her advertising ideas gets picked up for a radio commercial, and she notes that she may be the only person in improv class “juggling both a passion and a successful career” (imaginary stress on “and”). Her luck continues when she gets cast on The Office, her previous gigs consisting of commercials, live comedy skits, and playing a surly veterinarian’s assistant in a training video. She even makes a short list of her work experience, which include jobs like “A cashier at a cupcake store,” “A cashier at a frozen custard store,” and “Drove a child actor to and from the set of M. Night Shyamalan’s The Village.” This is far from the only list in the book, as Kemper adds “list-making” to the list of abilities she takes pride in, alongside her extremely strong quads (shades of Kimmy Schmidt’s rowing team credentials) and her ability to keep the conversation going no matter what. Other lists include items she actually ordered online while sitting at that Office reception desk (“A sky-blue chevron rug from Gilt.com,” “my dress for the 20111 Emmys”) or things her husband thinks will kill you (“fumes from a chimney,” “fumes from a truck,” “various other fumes”). The disparate and punctuation-laden book zig-zags through various landscapes, including Kemper’s childhood, her adolescent field-hockey career, and insight as a relative newcomer to the star-studded world she now resides in (Joan Cusack gives her the cardigan right off her back; she learns that Steve Carell is the only person on the Office set allowed to touch the bagels at the craft service table without tongs). At times her corn-fed innocence is a tad unrealistic—she didn’t really think Office guest Bryan Cranston was going to get the cast members hooked on meth, right?—and a one-note chapter like “Hulk” stretches the premise that Kemper turns into a monster when hungry. But for the most part, Kemper’s volume contains winning, delightfully described commentary with adorable gaffes any of us could imagine making, like telling Tina Fey immediately upon meeting her, “You have great hair—really strong and thick!” And it’s somewhat gratifying to learn that even the sunny Kemper can turn petulant upon losing her preferred bike at SoulCycle. The non-linear chapters make for a handy read to glide you through train commutes and waiting rooms—as long as you’re comfortable shedding tears of laughter in public. Kimmy Schmidt wraps up for good in 2019, and Kemper, mom to a 2-year-old, has kept her plans open for now. 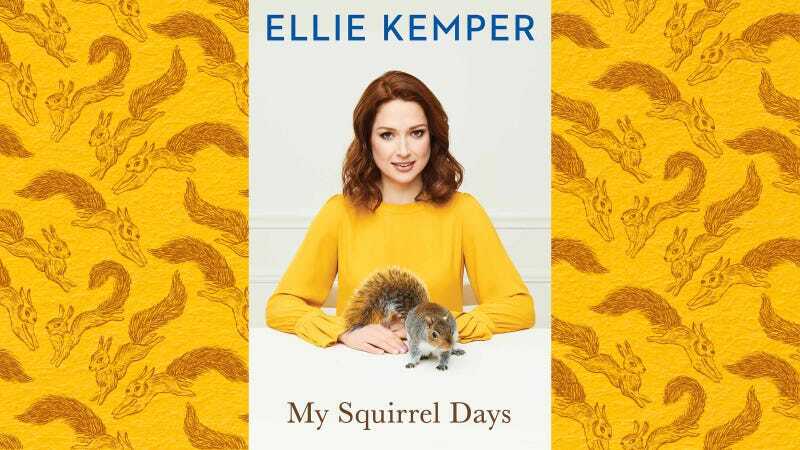 But after a fun, funny release like My Squirrel Days, we can only hope that Kemper’s future involves not only more onscreen efforts but also myriad literary ones.